Built in grand style, Gunsight Lodge is an amazing property. 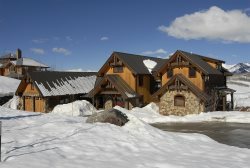 Situated right on the slopes with ski-in/ski-out access right outside the ski room door! This home was designed to lavish it's owners and guests in style. Constructed but a few short years ago with incredible attention to detail this property is not to be missed. Located on a spectacular piece of property which commands incredible views from virtually every room no matter the season! With expansive windows throughout the home, one takes in the sweeping vistas from over 10,000 ft elevation. Overlooking the massive West Elk Mountains and beyond you get a true sense of nature's beauty. Upon entering the home, the grand architecture immediately grabs you. The craftsmanship of the construction is evident at every turn and the property is exquisitely furnished in the "luxury mountain" style. Despite it's size, the home feels comfortable and downright cozy! With 6 bedrooms sleeping 12 people in grand style, this is the perfect retreat for your Crested Butte luxury vacation. All bedrooms have en-suite bathrooms hosting such features as steam showers and jacuzzi bathtubs. Materials used are composed of fine granite, marble, and wonderful tile accents to create luxury bath retreats. There are HD flat panel televisions in almost every room and are accented by a whole house sound system as well as theater surround sound in the downstairs family game and media room. Universal remotes and the latest in television technology insure the world news is never far away should you grow tired of the incredible views! High speed wireless is available throughout the home so staying connected at 10,000 ft up is not a problem should you have to check the occasional e-mail or send pictures to friends of postcard views. With it's open floor plan, Gunsight Lodge excels at entertaining family and friends. The kitchen is a state of the art masterpiece and takes in some of the most commanding views in the home. Top of the line appliances including double ovens, an ice maker, sub-zero fridge, and a 6 burner gas range insure that whether the catering staff is preparing your meal or you have to actually cook yourself, the occasion will be memorable. Just off the kitchen is one of the most fantastic rooms in the home. With luxurious furnishings and views out all sides, you will feel like you are in the clouds. Enjoy your cup of coffee in the morning or just relax with a good book! Your Crested Butte vacation wouldn't be complete without spending time outside in fantastic weather! The stamped concrete patio is right on the slopes and houses an over sized hot tub with unobstructed views of the West Elk Mountains and right on the slopes. Soak your muscles in the hot tub while looking up at an endless sky full of stars. In the winter the patio is heated for your comfort and in the summer, the fields around Gunsight explode with wildflower color. (They don't call Crested Butte "The Wildflower Capital of Colorado" for nothing. Hike right out your door in the summer with an almost endless supply of trails on Mt. Crested Butte or take some turns on the hill right out the door of the custom ski room outfitted with washer/dryer, boot dryer, benches, and ski storage. We can even arrange for our in house ski-rental and fitting service to set you up in the home. No need to go to the base and stand in line, not at Gunsight Lodge! Be sure to book your time in paradise at Gunsight Lodge! We really appreciated the friendliness and helpfulness of all of the staff. Thank you for going the extra mile in finding us a grill since we were unable to use the one at the house because of the fire ban. We loved this property and the view was spectacular! I worked with a couple of different people but mainly Katie. Katie made the booking process an absolute breeze. We were on the phone for maybe 10 minutes before our rental was fully booked. She responded to emails promptly, had our lift tickets waiting for us at the house and also got us hooked up with a ski equipment delivery service. We literally just showed up and were able to ski...no lines to wait in. She also arranged for a Christmas tree in the house which was beautiful. Any time i called or emailed with questions, she returned the call or email within the hour. Completely hassle free vacation. Awesome service!!!! I could go on and on about Gunsight Lodge. We had 12 people in the house and had plenty of room when we wanted it. The kitchen is awesome for gathering, as there is seating at the bar and in the breakfast nook. The downstairs area was fantastic, also. Pool table, fireplace, movies, etc. This is true ski in/out....the slope is about 25 yards from the back door, which leads to the room with boot driers, cubbies, hooks to hang your clothes, etc. We also used the outdoor fire pit nightly. The views.....unbelievable. This house is fully stocked and ready for vacationers. I can honestly say this was the best family vacation we have ever taken and all 12 people agree. I wouldnt hesitate at all to book through Iron Horse in the future. Everyone at Iron Horse has always been very friendly, prompt with response to questions, and helpful! This is our 2nd year in a row to rent from them and we will continue to rent from them! Gunsight Lodge was beautiful! The home was lovely and the views were breathtaking! The ease of ski in/ski out was also wonderful for the beginner skiers in our group! * We can’t control the weather! Ski access dependent upon snowfall.